The orangutans are three extant species of great apes native to Indonesia and Malaysia. 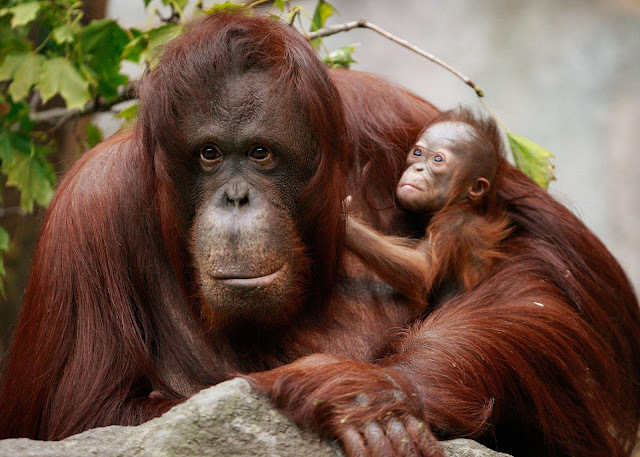 Orangutans are currently only found in the rainforests of Borneo and Sumatra. Classified in the genus Pongo, orangutans were originally considered to be one species. From 1996, they were divided into two species: the Bornean orangutan (P. pygmaeus, with three subspecies) and the Sumatran orangutan (P. abelii). In November 2017 it was reported that a third species had been identified, the Tapanuli orangutan (P. tapanuliensis). Genomic comparisons show that the Tapanuli orangutan separated from the Sumatran orangutan about 3.4 million years ago. The Tapanuli orangutan separated from the Bornean orangutan much later, about 670,000 years ago. The orangutans are the only surviving species of the subfamily Ponginae, which also included several other species, such as the three extinct species of the genus Gigantopithecus, including the largest known primate Gigantopithecus blacki. The ancestors of the Ponginae subfamily split from the main ape line in Africa 16 to 19 million years ago (mya) and spread into Asia. Orangutans are among the most intelligent primates; they use a variety of sophisticated tools and construct elaborate sleeping nests each night from branches and foliage. The apes have been extensively studied for their learning abilities. There may even be distinctive cultures within populations. Field studies of the apes were pioneered by primatologist Birutė Galdikas. All three orangutan species are considered to be critically endangered. Human activities have caused severe declines in populations and ranges. Threats to wild orangutan populations include poaching, habitat destruction, and the illegal pet trade. Several conservation and rehabilitation organisations are dedicated to the survival of orangutans in the wild. 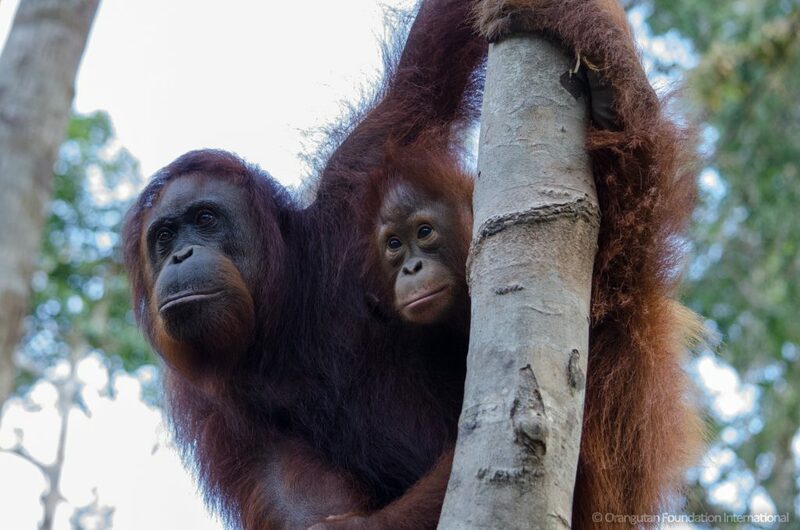 The Malay words used to refer specifically to the ape are maias and mawas, but it is unclear if those words refer to just orangutans, or to all apes in general. The first attestation of the word orangutan to name the Asian ape is in Dutch physician Jacobus Bontius' 1631 Historiae naturalis et medicae Indiae orientalis – he reported that Malays had informed him the ape was able to talk, but preferred not to "lest he be compelled to labour". The word appeared in several German-language descriptions of Indonesian zoology in the 17th century. The likely origin of the word comes specifically from the Banjarese variety of Malay. The word was first attested in English in 1691 in the form orang-outang, and variants with -ng instead of -n as in the Malay original are found in many languages. This spelling (and pronunciation) has remained in use in English up to the present, but has come to be regarded as incorrect. The loss of "h" in Utan and the shift from n to -ng has been taken to suggest that the term entered English through Portuguese. In 1869, British naturalist Alfred Russel Wallace, co-creator of modern evolutionary theory, published his account of Malaysia's wildlife: The Malay Archipelago: The Land of the Orang-Utan and the Bird of Paradise. The name of the genus, Pongo, comes from a 16th-century account by Andrew Battel, an English sailor held prisoner by the Portuguese in Angola, which describes two anthropoid "monsters" named Pongo and Engeco. He is now believed to have been describing gorillas, but in the 18th century, the terms orangutan and pongo were used for all great apes. Lacépède used the term Pongo for the genus following the German botanist Friedrich von Wurmb who sent a skeleton from the Indies to Europe.